Here are a few questions we are frequently asked. If you have a question that is not listed below, contact us today and we’ll be happy to answer it for you! • Why do I need a rain sensor and what what brand do you recommend? • How much water does my lawn need? • What type of heads should I use? • What maintenance programs do you offer? • Will I get a custom design with my estimate? • Do you do renovations to existing irrigation systems? • What is the best time to water? Why do I need a rain sensor and what what brand do you recommend? Sensors are an imperative feature of any efficient irrigation system. Without one, sprinklers continue to run during inclement weather conditions, wasting water and causing embarrassment for the homeowner. The Hunter Rain-Clik commands a controller to shut off immediately right when it starts to rain. The Rain/Freeze-Clik also shuts down systems when the temperature drops, so there’s no danger of hazardous excess icy buildup. Either sensor can be mounted on an eave or any flat vertical surface like a wall or fence. A gutter mount is also available that allows for easy installation on the edge of gutter. There are a lot of rain-sensing devices on the market today, but most shut off an irrigation system only when a pre-set level of accumulated water is reached. Only the Hunter Rain-Clik products, with their unique Quick Response feature allow an irrigation system to shut off immediately when it starts to rain. So there’s no risk of giving the impression water is being wasted. Most lawns require a minimum of 1 to 2 inches of water per week. Watering every other day for about 1 hour on rotary zones or about ½ hour on spray zones will typically supply your lawn with about 2 inches per week. There are many types of soil on Long Island each requiring different watering schedules. The South Shore areas require watering more often( because of the sandy soil conditions) verses the North Shore areas requiring watering less often (because of the clay type soil conditions). Our professionals will be able to set your irrigation controller for the proper amount of water your lawn, flowers and shrubs may require. What type of heads should be used? With a custom designed irrigation system designed by Creative Irrigation, our professionals design your system with the latest equipment available. Rotary type heads are used for large turf area. These heads have a radius of up to 35 feet and are fully adjustable. All rotary heads installed in the lawn areas are level with the root of the grass and are pop-up type so lawn mowing does not cause damage to the heads. Spray or mist type heads are typically used in small turf areas and garden areas. They have a soft misting type spray with a radius of up to 15 feet and are fully adjustable. These type heads can pop-up from 2” to 12” depending on the application. Other type heads and drip irrigation is available for specialty watering of potted plants, hanging baskets, window boxes, rose gardens and high traffic areas. If you have special watering needs, call us today and let our experts give you some advice on how we can accommodate your irrigation needs. Snow, ice and below freezing temperatures can cause damage to your irrigation system, which is why we take several precautions to “winterize” or protect your sprinkler system in the fall. We close all water and electrical sources properly and use an air compressor to blow all water out of the underground sprinkler lines. This prevents any leftover water from freezing and damaging the irrigation lines. In the spring, we open up all water and electrical sources and slowly reenergize the sprinkler lines. 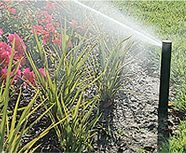 We perform all necessary seasonal adjustments – check and adjust your sprinkler heads for plant growth and other landscape changes and to ensure they are operating properly, program the water timer (clock), as well as check all main sprinkler lines and manifolds for leaks, If necessary, we will repair sprinkler at this time. As the seasons change, it becomes necessary to adjust the water timer and frequencies to avoid over or under watering due to temperature changes and varying weather conditions. During the summer, we will check and adjust your sprinkler heads, sprinkler pipe and drip irrigation for plant growth and other landscape changes and to ensure they are operating. Will I get a custom design with my estimate? Yes! With every estimate, a custom design will be supplied to you by our estimator. He will go over every detail of how your irrigation system will cover your property and the location of all the irrigation heads. This design will enable you to understand how your irrigation system will cover your lawn, flowers, shrubs and gardens. Do you do renovations to existing irrigation systems? Yes! If your irrigation system has seen better days or has never worked properly from the beginning, Creative Irrigation can renovate it and have it working the way it should. If you are installing a new pool, deck, widening your driveway or any other types of addition that damages your irrigation system give us a call for a free accurate estimate. Watering your lawn or landscape during the heat of the day may cause more harm than good. Most of the water that is being put down is also evaporating due to the heat. The best time to water is in the early morning before the sun comes up. This will give the water a chance to soak in and reach the root system of the lawn and plants and develop a good root system.